"We really appreciate how quickly you put the program together and the fast responses to our questions to get this off the ground quickly. You definitely had a hand in making Haiti a better place to receive healthcare!" "The Haitians LOVED the program and found it very easy to use. Within only 2 days of teaching the program we had 7 people trained and comfortable using the program and knowledgeable enough to teach it to others." Operation Blessing is a non-profit organization that teams with volunteers to help victims of natural disasters performing various humanitarian tasks. Medical professionals from Mayo Clinic in Rochester, MN, (organized by Operation Blessing), has been providing life-saving medical care to countries that cannot afford to pay for such services. PlanetJ was consulted to provide a quick, inexpensive and intuitive web application to help in their mission; of providing Haitian hospitals the benefit of a web based medication supply and inventory application. The earthquake in Haiti devastated many villages throughout the country. While many people died, there continues to be numerous impoverished sick children and adults seeking treatment, and supplies are quite limited. Volunteer pharmacists, nurses, and physicians have been donating time and medicine to help three hospitals in Haiti, but they lacked a simple way for them to request medications and manage existing inventory. It was also necessary to have the application easy to use and bilingual to serve the Haitian hospital staff as they have limited experience in use of computer technologies. 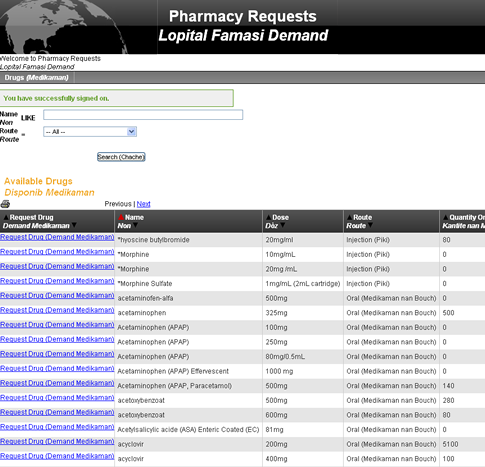 PlanetJ, using the WOW product, developed an online web application in about a week that allows administrators the ability to add, edit and delete inventory items; remove inventory quantities; view drug requests by hospital and/or status; provide ability for hospitals to view order request status administration to process drug requests from hospitals. 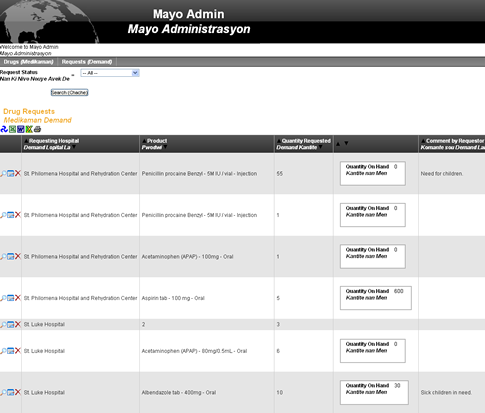 This application also has a secured access to both administration and hospital staff. Because of the multi-language support (English and Creole) provided in the application, the Haitians caught on very quickly. 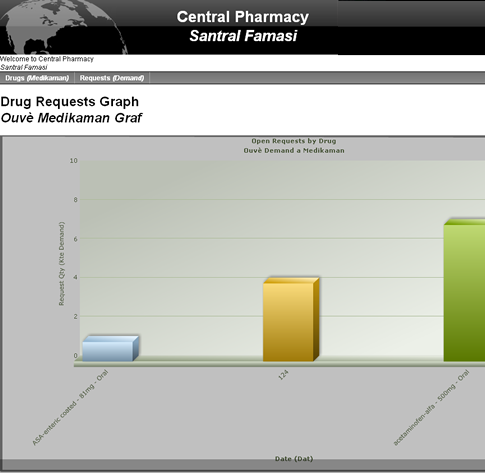 There were a total of three applications built to solve their request; Administration, Central Pharmacy, and Hospital Request. Each will be described more in-depth below. Overview: The Administration application allows a user to check inventory levels, check requested medication and fill or deny orders from the three participating hospitals. Inventory levels can be updated or deleted by Administrators as well. 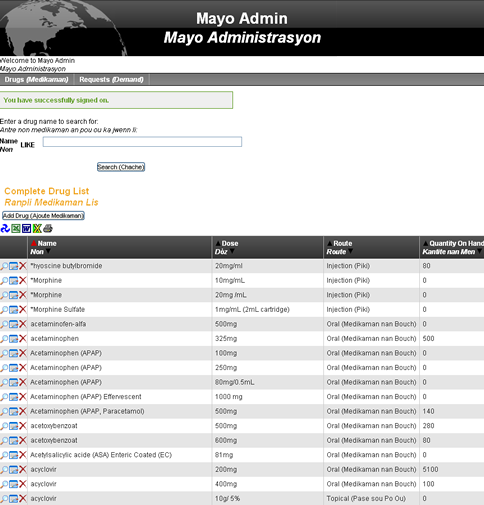 From a drop down list on the Admin home page, a user can easily enter in new medications. This application is displayed in English and Creole. 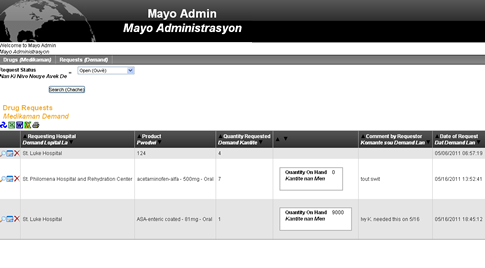 Administrators can see which hospital is requesting which products, how many, quantities on hand and other miscellaneous requests. Further search can be done on status "open requests. 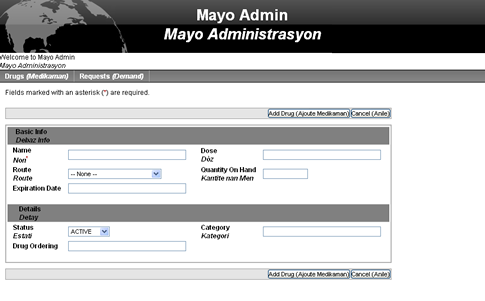 As with the Admin application, new medications can be entered as well. Medication managers can monitor which hospitals have open requests, approve or disprove quantities within their requests, and change status to "open, approved, or denied"
Workers in the Central Pharmacy can also view open requests via text or chart. Overview: The Pharmacy Requests application allows the three individual hospitals to sign-in with a secure user name and password. 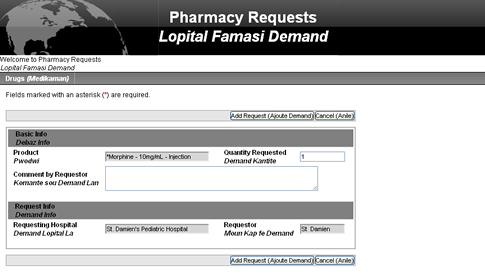 Once the hospital user signs on, they are brought to the Requests screen. 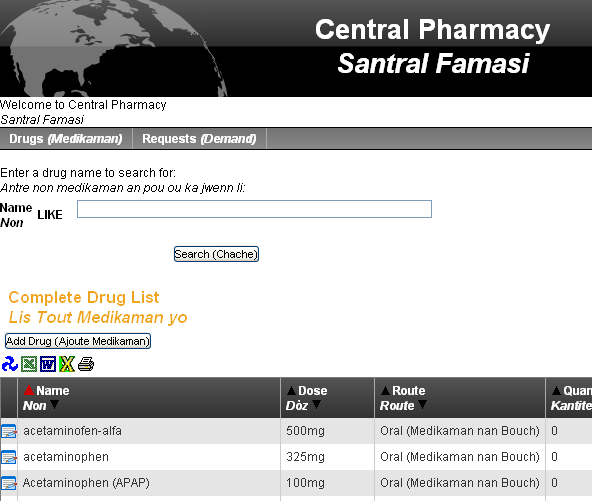 The user can then begin requesting medication by clicking on the blue hyperlink on the right. 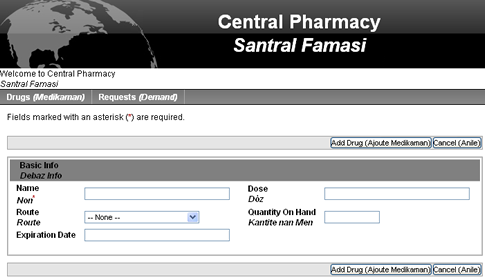 Once the user clicks the hyperlink to Request the Drug, the user is brought to a request page where they can fill out the quantity of medicine they require as well as any comments they may have for the Pharmacist. They cannot change dose, product or requesting hospital. PlanetJ Corporation has been able to assist medical professionals in Haiti better manage their medications through a powerful WOW based application. Since the original applications have been in use, particpating pharmacists have made multiple return visits to the area. It is planned to install the pharmacy program in multiple new hospitals in the upcoming months.